Children sweeten labours, but they make misfortunes more bitter: they increase the cares of life, but they mitigate the remembrance of death. Among the least acknowledged facts of American modernity is the extent to which parents, acting in their familial capacity, naturally and tenaciously guard their young children from threat and peril, to the point of risking their own physical and economic security in extreme cases; however, as part of the political and governing community—that is, the ruling generation—many of these same parents wittingly and unwittingly join with other parents in tolerating, if not enthusiastically championing, disadvantageous and even grievous public policies that jeopardize not only their children’s future but the welfare of successive generations. To be clear, not all parental decisions are impactful or consequential in the lives of children; obviously, not all decisions are equal. Indeed, the most attentive and nurturing parents are not and cannot be conscious of every decision they make inasmuch as the totality of such decisions is likely incalculable even on a weekly or monthly basis. Moreover, in the healthiest families, the most considered parental decisions, based on seemingly prudential judgments, can and do produce unintended consequences. Of course, the same can be said of decisions about public policy and governing in a relatively well-functioning community. History confirms Burke’s observation. To embrace the moral order as parents nurturing their children, yet to abandon the moral order as members of the ruling generation, thereby contributing to predictably deleterious public policies with prospectively calamitous outcomes, is a decadence that leads to unstable and potentially oppressive or even tyrannical conditions which, in the end, degrade and disassemble the civil society and consume their children’s generation and generations beyond. Reformation and recovery may be possible but difficult and complicated, and typically only after the exaction of an enormous human toll. Burke’s commentary was motivated by his reflections on the decade-long French Revolution and his revulsion at the anarchy and horror it unleashed. In the ensuing more than two centuries, and up to this very moment, the world has witnessed much worse. This is not to say that all instances of civil and societal dislocation take the form of bloody revolution or civil war. Obviously, there are varying pathologies peculiar to particular doctrines, cultures, governing systems, and so on. There are also differing events and circumstances, some building over time and others descending more abruptly, that contribute to the character of the discontinuity. But violence is the ultimate exposure. In modern America, the unraveling of the civil society had been subtly persistent but is now intensifying. Evidence of rising utopian statism—the allure of political demagogues and self-appointed masterminds peddling abstractions and fantasies in pursuit of a nonexistent paradisiacal society, and the concomitant accretion of governmental power in an increasingly authoritarian and centralized federal Leviathan—abounds. As subsequent chapters will demonstrate, the ruling generation’s governing policies are already forecast to diminish the quality of life of future generations. Among other things, witness the massive welfare and entitlement state, which is concurrently expanding and imploding, and the brazen abandonment of constitutional firewalls and governing limitations. If not appropriately and expeditiously ameliorated, the effects will be dire. And the ruling generation knows it. However, why do so many loving parents, as part of the ruling generation, abandon the civil society for the growing tyranny of a voracious central government that steals their children’s future, thus condemning their children and unborn generations to a dangerously precarious and unstable environment, despite a large majority acknowledging the national decline for which they blame politicians? There are a number of possibilities. For example, language itself can contribute to the problem. The words “generation” and “ruling generation” and “future generations” can be imprecise and, for some, elusive. They can be thought of as merely theoretical and conceptual, or an unreality. Hence, the growth of numerous offshoots intended to provide context and clarification: Baby Boomers, Generation X, Millennials, Generation Z, etc. That said, it is neither my purpose nor my desire to give them each exposition and fill these pages with distractions about sociological constructs. Nonetheless, despite inexact nomenclature, there are differences relating to various age groups, some big and others inconsequential, just as there are similarities and shared interests. This is also true of individuals generally. More to the point, and importantly, parents are constantly thinking about and talking about their own children, and interacting with them in their everyday lives. Obviously, children are of flesh and blood, and their existence and condition are reality. Given that the future is not the here and now and future generations are images or ideas of amorphous groups of strangers, born and unborn, parents can delude themselves that their own children’s immediate welfare, which they work to protect and improve, can be detached from the well-being of future generations. Certainly, not all parents or members of the ruling generation downplay or disregard the soaring costs and heavy burdens of scores of public policies on their children and future generations. Many are acutely aware of the gathering storm of societal and economic disorder and wish to do something about it. For them, the difficulty lies in not knowing how to effectively influence the omnipresence and complexity of a massive governing enterprise that is less republican and more autocratic, an ambitious project indeed. The masterminds and their flatterers are progressively immune to regular democratic processes and pressures, such as elections and citizen lobbying, unless, of course, the electoral results and policy demands comport with their own governing objectives. Otherwise, they have an escalating preference for rule by administrative regulation, executive decree, and judicial fiat as the ends justifies the means. Many in the ruling generation have themselves become entrapped in economically unsustainable governmental schemes in which they are beneficiaries of and reliant on public programs, such as unfunded entitlements, to which they have contributed significantly into supposed “trust funds” and around which they have organized their retirement years. They also find self-deluding solace in the politically expedient and deceitful representations by the ruling class, which dismisses evidence of its own diversion and depletion of trust funds and its overall maladministration as the invention of doomsayers and scaremongers. Thus mollified, many in the ruling generation are by and large inattentive and heedless about the bleak prospects inflicted on younger people, who will neither benefit from the government’s untenable programs, into which they are or will also be forced to make “contributions,” nor possess the wherewithal to pay the trillions of dollars in outstanding accumulated debt when the amassed IOU bubble bursts during their lifetimes or the lifetimes of future generations. Still, it is argued that millions of people benefit from such programs. Of course, trillions of dollars in government expenditures over many years most assuredly benefit the recipients of subsidies or other related payments. But this does not change the arithmetic. The eventual collapse of a colossal government venture will indiscriminately engulf an entire society and economy, including its millions of beneficiaries and benefactors, resulting in widespread disorder and misery. While this alone is daunting, no less derelict and pernicious are the other seemingly myriad ideological pursuits and social designs loosed on society by a ubiquitous federal government. There is no comparable corporate structure shoring up the civil society and counterbalancing the federal government’s discrediting and impositions. The federal government makes, executes, and adjudicates the laws. It even determines the extent to which it will comply with the Constitution, which was established in the first place to prevent governmental arrogation. Oppositely, the civil society does not possess mechanical governing features that, at the ready, can be triggered and deployed in its own defense. Ultimately, a vigorous civil society and a well-functioning republic are only possible if the people are virtuous and will them. Therefore, what parents and the ruling generation owe their children and generations afar are the rebirth of a vibrant civil society and restoration of a vigorous constitutional republic, along with the essential and simultaneous diminution of the federal government’s sweeping and expanding scope of power and its subsequent containment. If the ruling generation fails this admittedly complicated but central task, which grows ever more difficult and urgent with the passage of time and the federal Leviathan’s hard-line entrenchment, then the very essence of the American experiment will not survive. As such, it can and will be rightly said that the ruling generation betrayed its posterity. But what will be said of the younger generation—that is, the rising generation—say, young adults from eighteen to thirty-five years of age, if their response to the mounting tyranny of centralized, concentrated governing power is tepid, contributory, or even celebratory? Do they not wish to be a free and prosperous people? Do they not have a responsibility to preserve their own well-being and that of subsequent generations by resisting societal mutation and economic plunder? The rising generation seems wedged in its own contradictions. While it is said to distrust ambitious authority and question the so-called status quo, further examination suggests that in large numbers its members sanction both through their political behavior and voting patterns. Although they self-identify as political independents, Pew Research reports that the rising generation “vot[es] heavily Democratic and for liberal views on many political and social issues,” including “a belief in an activist government.” Furthermore, when asked “would you say that most people can be trusted or that you can’t be too careful in dealing with people, just 19% . . . say most people can be trusted.”10 But what is activist government if not trust in a relative handful of political masterminds exercising extraordinary power and commanding a large army of civil servants to manage the lives of millions of individuals? Paradoxically, there is no age group more enthusiastically reliable and committed by political deed to an activist if not fervent governing elite than the rising generation, and no age group more jeopardized by it. Anomalies can be difficult to unravel; however, a few observations are merited. As a general and logical matter, younger people’s dearth of life experiences and their quixotic idealism make them especially vulnerable to simplistic appeals and emotional manipulation for utopia’s grandiosity and social causes, which are proclaimed achievable only through top-down governmental designs and social engineering and, concurrently, the detachment from and deconstruction of societal traditions, customs, and values, for which they have little or modest conception and investment. Consequently, while in the main and abstractly the rising generation may be distrustful of authority and people, younger people are also especially susceptible to seduction by demagogic politicians, propagandizing academics, charismatic cultural idols, and other authority and popular figures propounding splendid notions of aggressive government activism for and through such corresponding militant causes as “social justice,” “environmental justice,” “income equality,” and other corollaries of radical egalitarianism. Inasmuch as the proclaimed injustices and imperfections of the civil society are presumably illimitable, so are the infinite reactionary governmental prescriptions and interventions allegedly required to abate them. Therefore, government activism and social designs in this context are perceived as routine, indispensable, and noble. However, the erosion of individual sovereignty, free will, and self-sufficiency necessarily give way to dependence, conformity, and finally tyranny. These utopian causes and movements are evinced by demands for assorted forms of expanded statism—increased governmental usurpations and empowerment—which invariably contribute to the deterioration of the civil society. To be clear, however, the rising generation is among the most devoted advocates of activist government. Consequently, it cannot be said to rebel against authority, although its members may believe that they do, but sanction its exercise and abuse in an incrementally severe centralized government, the latter of which, and its effects, have steadily emerged as the predominant characteristic of the actual status quo. In particular, undergirding the rising generation’s ethos in this regard is the relentless indoctrination and radicalization of younger people, on a daily basis and over the course of many years, from kindergarten through twelfth grade to higher education in colleges and universities, which engrains within them a vulnerability to exploitation and zealotry. It builds among them acceptance or even clamor for self-destructive policies and conditions that ensure future economic and political instability. By cultivating agitation and balkanization almost nothing about the civil society is said to be true, right, or lasting and, therefore, worth preserving and perpetuating. Instead, much uproar is generated in the quest for utopian abstractions and societal transformation—the fundamental cause around which younger people have been encouraged and trained to rally, to their detriment and the jeopardy of subsequent generations, and to the benefit of the statist. The laws of economics, like the laws of science, are real, unlike the utopian images and empty assurances of expedient and self-aggrandizing politicians and bureaucrats. There is a point of irreversibility from which no generation and the larger society can recover. Moreover, just as economic and political liberty are intertwined, spreading economic instability leads to political turmoil and, ultimately, societal disorder or collapse. In the interim, as this process unfolds, the dissolution of constitutional republicanism—including representative and consensual governance, dispersed authority among federal branches and between the federal and state governments, and the empowerment of a pervasive federal administrative state incessantly insinuating itself into the lives of the people—becomes regular and routine. The ensuing amalgamation of governmental control, and the escalating police powers discharged to coerce and subjugate the individual through multitudinous rules, regulations, taxes, fines, and penalties, confounds and benumbs much of the citizenry. Furthermore, the designed societal transformation and decay of enlightened self-government are portrayed as compassionate, progressive, and inevitable. Nonetheless, the federal colossus will not reform itself and self-surrender its design. Its advocates, surrogates, and beneficiaries neither admit failure nor entertain circumspection. They are increasingly fanatical as they insist on more zealous applications of their ideological preoccupations and societal schemes. The time is urgent for the ruling generation and the rising generation—that is, parents and their progeny—to step up in defense of their joint interests and in opposition to their common foe—a government unmoored from its constitutional beginnings and spinning out of control. The statist abuses and exploits younger people and subsequent generations, expropriating the fruits of their labor and garnishing wealth yet created, as a cash cow for voracious, contemporary governmental plundering, and manipulating and constricting their prospects and liberty even before they are of age to more fully pursue and enjoy them. The ruling generation, upon sober reflection, must stir itself to action in order to untangle the web of societal and generational conflicts produced by the statists’ endless and insidious social engineering and encroachment, even though it requires some level of economic self-sacrifice and partial withdrawal from governmental entitlements and subsidies. The equally formidable struggle for younger people is first to recognize the constant and self-reinforcing influences of statist manipulation and exploitation, break loose from them, and then rally against them in their own defense. The rising generation must question, confront, and civilly resist the real authoritarianism that endangers its future and the quality of life of those not yet born, whether preached in the classroom, popularized through entertainment, or idealized by demagogic politicians. Their well-being as a free, self-sufficient, and thriving people is at stake. The real fight they must wage is against utopian statism, which grows at the expense of the civil society and their own security and happiness. Otherwise, the rising generation—and unborn, unrepresented generations that follow—will degenerate into a lost and struggling generation, living an increasingly bleak and hollow existence under steadily more centralized, managed, and repressive rule. At the beginning of this chapter I asked: Can we simultaneously love our children but betray their generation and generations yet unborn? The answer is no. I also asked: Do younger people wish to be free and prosperous? Do they have a responsibility to preserve their own well-being and that of subsequent generations by resisting societal mutation and economic plunder? The answer to both questions is yes. It turns out that the ruling and the rising generations have much in common after all. In the first place and in the end, we must rely on our individual and collective capacity, albeit imperfect and fallible, for sound judgment and right reason. There are eternal and unchangeable universal truths that no professor, politician, expert, or combination thereof can alter or invalidate. The mission of this book, as in my past books, is to persuade as many fellow citizens as possible, through scholarship, facts, and ideas, to avert a looming tragedy—not a Greek tragedy of the theater and mind, but a real and devastating American tragedy, the loss of the greatest republic known to mankind. 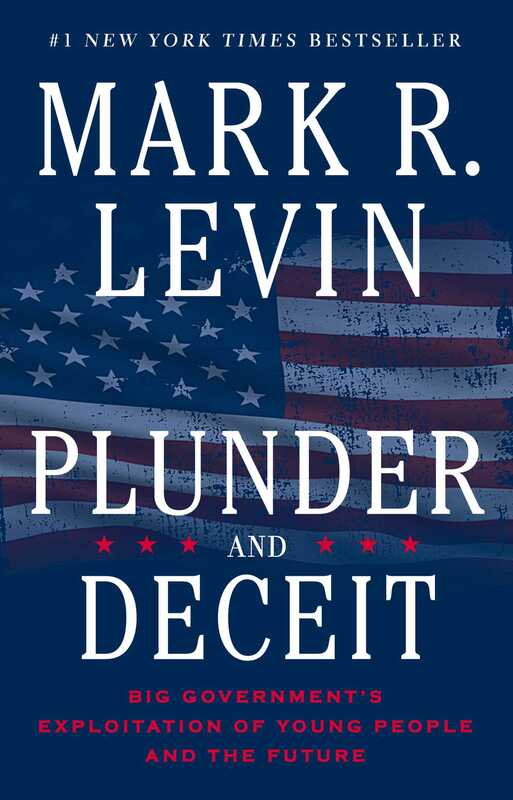 "Everything that has made Mark Levin one of the conservative movement’s most influential voices is there in his new book Plunder and Deceit. There’s championship-level rhetoric, Mr. Levin's trademark unapologetic zeal, as well as his relentless flood of facts and data...Plunder and Deceit is more than a book. It’s a manifesto. The likes of which you’d expect to be written by an Old Testament prophet pleading with the emerging generation to return to the righteous path their ancestors strayed from....Mr. Levin has authored a Rosetta Stone for a true conservative to win back the White House in 2016." “This book is required reading for any parent with college-age children…crisp and compelling." "Every American adult should buy or borrow a copy of Plunder and Deceit for a young person they know. Our mission as Americans must be to educate, inspire, and engage; with Levin's latest masterwork, we have every tool we need to help the next generation succeed. We must not delay." "Levin...has five bestsellers under his belt. With this release, it will be six, and it deserves to be...Full of history, it’s also packed with easily recallable statistics anyone can use...It’s a handbook for candidates and citizens alike." "Mark Levin's new book will no doubt be a bestseller...his latest work should be required reading for every recent college or high school grad...[he] explains in elegant, but easy to understand terms just how Washington and the elites who infest the nation’s capital are stealing our future."